I'd still prefer announcements and changelogs go hand in hand with releases, not half a step and a day apart. I can understand communication misses and defective documentation from some anarchist open-source community, but Opera is a company with a full-time paid propaganda division. All I can say is that I've installed 12.17 over 12.16 and so far I didn't notice any inconvenience. All my settings have been preserved. However, I'm still on testing. Mac and Linux are not affected, and will not receive a 12.17 update. The official announcement says only the installer was affected, so logically you didn't get a new browser version. You got a new installer version with the new download. However, there's a big but. The world is not logical, and this particularly applies to Opera company. For example, version 12.15 was supposed to only fix some security issue over 12.14, but also messed up search engines as an additional undocumented feature. For example, version 12.15 was supposed to only fix some security issue over 12.14, but also messed up search engines as an additional undocumented feature. What on earth is Aura? The team here put a lot of effort into getting Aura to work properly with Opera and the benefits are already paying off. Aura allows for smoother, snappier animations with a more responsive feel. So far, we have only scratched the surface of this technology, and Opera 21's primary intention was to get Aura working and stable. In the future, you will see further benefits as it allows us to give everything that little extra bit of polish! From here I only gather snappy polished effects courtesy of hardware acceleration. Now, I know - assume rather - that hardware acceleration can be put to some good use, but I also know - quite concretely - that it can prevent using some applications. Example: A while ago I tried to mintify an Ubuntu installation step by step, to ultimately replace Unity with the finest desktop Mint can offer - Cinnamon. The first step was to install Cinnamon alongside with Unity. The elements of these two desktop environments noticeably clash with each other, so one of them had to go one day in the name of smoother user experience. In this process I landed into a situation where Cinnamon turned visually into something horrible and displayed a lengthy error message that hardware acceleration was not in use and something about graphics. Either I screwed something up when uninstalling things or the package maintainers overlooked a conflict. Either the graphics driver got affected by Unity-Cinnamon clash over time or the hardware on the machine was not hardware-acceleration-friendly. It could be my fault, Ubuntu's, Cinnamon's, or the fault of Linux architecture in general. I am not competent enough to figure out. The point is that the most visible error message said that hardware acceleration had failed, something happened to the graphics driver, and that's why I could not use Cinnamon, a snappy flashy polished desktop, about which I didn't even know it used hardware acceleration until the error message. How could Aura fare better? Comments from those with direct access to Chropera and knowledgeable in hardware acceleration are welcome. This feature might seem small but we feel we should highlight it, as it has often been requested. We now provide an option to make Opera persistently show a page's complete URL in the address field. Anyway, there are two replacements for X in development. Mir seems to be a case of NIH. You mean a solution to my problem with hardware acceleration is to replace X? How do you replace X in Ubuntu 12.04 LTS? Wouldn't this lead to yet more package conflicts? I have found Ubuntu the least flexible distro of them all. Besides, I have not even figured out how to configure X parameters and fix its issues. Not time for me yet to try its replacements. Opera apologizes for wasting people's time. Nah, just that 21st century issues caused by using 1987 technology are being worked on. It was mostly about the Aura thing (which does have a software fallback, I imagine). About your problem, perhaps you could try removing Cinnamon and reinstalling it? It means running the browser in a 2-pane mode, where 1 pane (usually left) is deemed the source pane, and the other pane is deemed the target pane. The source pane is temporarily locked, allowing the receive pane to display the linked pages. Be the first browser to do this! I don't know if Opera was the first browser to do that, but what you're describing sounds an awful lot like create linked window coupled with MDI. To quote from, e.g., the Opera 8.52 help pages, a linked window constitutes a "new page in which to open links clicked in current page." Whatever one might propose, it was probably already implemented in Opera/Presto over a decade ago. A long time ago, web sites started detecting the name and version of the visitor's browser to adjust in various ways or throw tauntrums and demand upgrades. Boilesen's interview was an intellectually painful thing to watch. He had memorised some corporate statistics and always followed them up with something lame like "that's a good thing" or "we do things differently". It's even hard to comment on this. Then again, maybe that's the whole point. Dumbing down the populace is the corporate way of avoiding criticism. The side-effect of course is that the chief executives dumb down themselves too in the process, and Boilesen looks like an advanced specimen of this kind of evolution. But, you can search Google to get the latest news, entertainment and sports. I thought the Opera Portal had been turned into the native web version of Opera Discover when they removed the customization options. I guess I was wrong. To me also all talk about Discover reminded me about Opera Portal, but with less configurability. The concept is the same and that really means they are the same. To do such a thing, you don't really have to do anything at all, particularly when you take an existing concept and merely remove configurability. Do you mean they don't share the back-end? A portal whose only purpose is to collect clicks has no back-end in the relevant sense. The same concept - and formally the same company - suffices to define the thing as the same. Do you mean they don't share the back-end? No, I mean they closed the place down. But yeah, last year I think you could still customize Opera Portal. Or maybe it was a year and a half ago. Then they removed those options, so it was effectively the same as Opera Discover; similar content in any case. I guess usage dwindled into oblivion after they removed customization. The only thing that's surprising is they don't direct you to download the latest Opera and use Discover. Not at Opera Software as such, but the Alibaba purchase of UCWeb was a miniquake. It seems that it looks like Ubuntu for now. What the ....!? I never expected this!!! Agreed, no way this can be real. It just comes off as immature and unprofessional to me. I want to use a browser developed by real adults, not just a bunch of man-children who mock their ever-dwindling user base after having treated them like faeces for over a year. In one sense you could say that the Linux version is long overdue. 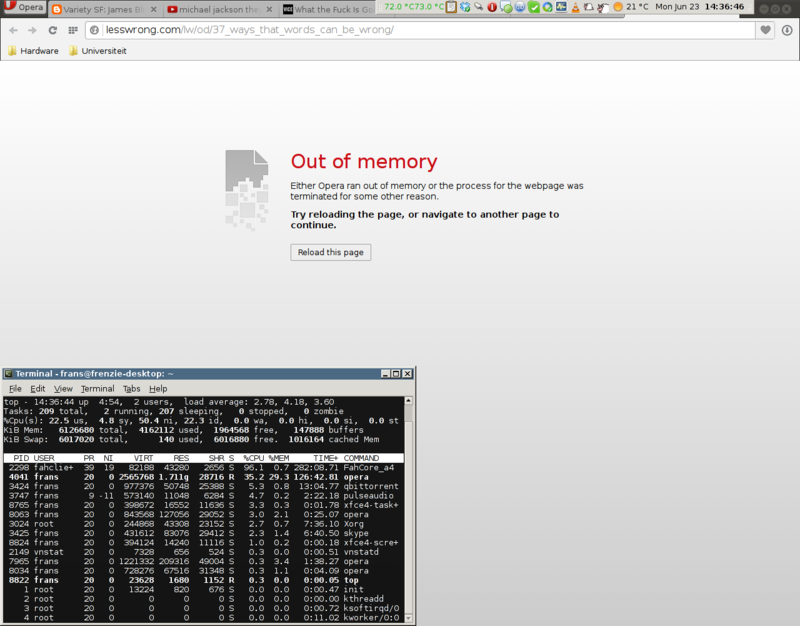 But since Opera faded away to irrelevancy, a Linux version really doesn't make any difference any more. Well, that seems a bit unfair to me. What is immediately obvious is that it cannot handle all of my "old" (automatically loaded) tabs properly and that it feels much slower than Otter. Notice how I have roughly 2GB of RAM available. I'm somewhat surprised it doesn't have the same sad kittens as on Opera Mobile. Anyway, Opera's better than Chromium; over the next months we'll see if it has anything on Iceweasel/Firefox with Tab Mix Plus as a secondary browser. Having looked around in Arch user repository (AUR) a bit, I can say there's interesting stuff to find there. New Chropera Developer branch is represented now, v.24. Interesting to see several random old Opera versions in AUR. I have used 11.62 for a while now. 11.62 is the version from where I plan to migrate to Otter when Otter is ready for it. Diverging even further from the browser root, Alibaba itself is about to IPO in a really big way. On August 8, shares of Alibaba, the Chinese e-commerce giant, under the ticker symbol "BABA," will go on sale to the public. It has the potential to be the largest tech IPO in history and perhaps one of the largest IPOs in history, period. Yet Alibaba remains a mystery and an unknown quantity to most investors, business people and consumers located outside of China. For those of us who work in China, engage in China related business, who are trying to reach Chinese consumers and work in e-commerce in the US and China, we all know the name Alibaba, but it is easy to forget that almost no one else does. Even those involved with the intersection of China, e-commerce and consumption don't have a full understanding of what Alibaba is, what it does and what it is planning on doing. It's helpful to start with this: Alibaba is the largest e-commerce company on EARTH. Alibaba processed more than $248 billion of online transactions in 2013, and handled 70% of all packages delivered in that time, all in China. To put that in perspective, the number two e-commerce company in the world, Amazon processed $100 billion and number three, eBay EBAY +1.25% $76 billion in online transactions. On the Chinese "Singles Day" holiday, Nov. 11, the company processed $5.75 billion in online purchases, in one day. More than that year's Black Friday and Cyber Monday sales combined in the U.S.